Editors-in-Chief: Abelson John N., Simon Melvin I. 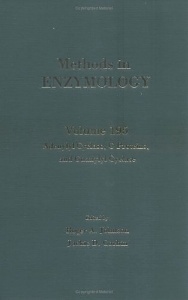 This volume emphasizes methods for the assay, purification, and characterization of adenylyl cyclases, guanine nucleotide-dependent regulatory proteins (G proteins), and guanylyl cyclases. R.A. Johnson and Y. Salomon, Assay of Adenylyl Cyclase Catalytic Activity. Y. Salomon, Cellular Responsiveness to Hormones and Neurotransmitters: Conversion of [3H]Adenine to [3H]cAMP in Cell Monolayers, Cell Suspensions, and Tissue Slices. T.F. Walseth, P.S.T. Yuen, and M.C. Moos, Jr. , Preparation of ~ga-32P-Labeled Nucleoside Triphosphates, Nicotinamide Adenine Dinucleotide, and Cyclic Nucleotides for Use in Determining Adenylyl and Guanylyl Cyclases and Cyclic Nucleotide Phosphodiesterases. T. Pfeuffer, Synthesis of Forskolin-Agarose Affinity Matrices. A. Laurenza and K.B. Seamon, High-Affinity Binding Sites for [3H]Forskolin. P. Wang and D.R. Storm, Purification and Characterization of Calmodulin-Sensitive Adenylyl Cyclase from Bovine Brain. E. Pfeuffer, S. Mollner, and T. Pfeuffer, Purification of Adenylyl Cyclase from Heart and Brain. W.A. Toscano, Jr., and M.K. Gross, Calmodulin-Mediated Adenylyl Cyclase from Equine Sperm. G.B. Rosenberg, P. Wang, and D.R. Storm, Isolation of Polyclonal Antibodies against Bovine Brain Calmodulin-Sensitive Adenylyl Cyclases. S. Mollner and T. Pfeuffer, Characteristics and Use of Monoclonal Antibodies to Various Forms of Adenylyl Cyclase. T. Braun, Purification of Soluble Form of Adenylyl Cyclase from Testes. H.R. Masure, M.G. Donovan, and D.R. Storm, Purification and Assay of Cell-Invasive Form of Calmodulin-Sensitive Adenylyl Cyclase from Bordetella pertussis. S.H. Leppla, Purification and Characterization of Adenylyl Cyclase from Bacillus anthracis. E. Pfeuffer and T. Pfeuffer, Preparation and Application of GTP-Agarose Matrices. J. Codina, D.J. Carty, L. Birnbaumer, and R. Iyengar, Purification of G Proteins. K.M. Ferguson and T. Higashijima, Preparation of Guanine Nucleotide-Free G Proteins. M.P. Graziano, M. Freissmuth, and A.G. Gilman, Purification of Recombinant Gs~ga. M.E. Linder and A.G. Gilman, Purification of Recombinant Gi~ga and G~ Proteins from Escherichia coli. S.M. Mumby and A.G. Gilman, Synthetic Peptide Antisera with Determined Specificity for G Protein ~ga or ~gb Subunits. R.A. Kahn, Quantitation and Purification of ADP-Ribosylation Factor. J. Moss, S.-C. Tsai, S.R. Price, D.A. Bobak, and M. Vaughan, Soluble Guanine Nucleotide-Dependent ADP-Ribosylation Factors in Activation of Adenylyl Cyclase by Choleragen. G.S. Kopf and M.J. Woolkalis, ADP-Ribosylation of G Proteins with Pertussis Toxin. D.M. Gill and M.J. Woolkalis, Cholera Toxin-Catalyzed [32P]ADP-Ribosylation of Proteins. R.Thomas and T. Pfeuffer, Photoaffinity Labeling of GTP-Binding Proteins. S. Offermanns, G. Schultz, and W. Rosenthal, Identification of Receptor-Activated G Proteins Using Photoreactive GTP Analog, ~ -32P]GTP Azidoanilide. D.J. Carty, R.T. Premont, and R. Ivengar, Quantitative Immunoblotting of G-Protein Subunits. P.J. Casey, I.-H.Pang, and A.G. Gilman, Assay of G-Protein ~gb~gg-Subunit Complex by Catalytic Support of ADP-Ribosylation of Go~ga. T. Higashijima and K.M. Ferguson, Tryptophan Fluorescence of G Proteins: Analysis of Guanine Nucleotide Binding and Hydrolysis. R.A. Cerione and E.M. Ross, Reconstitution of Receptors and G Proteins in Phospholipid Vesicles. S.E. Domino, D.J. Tubb, and D.L. Garbers, Assay of Guanylyl Cyclase Catalytic Activity. A. M~adulsch and R. Gerzer, Preparative Polyacrylamide Gel Electrophoresis Apparatus for Purification of Guanylyl Cyclase. A.A. White and P.J. Lad, Detergent Interactions and Solubilization Techniques for Membrane Guanylyl Cyclase. C.S. Ramarao and D.L. Garbers, Purification of Membrane Form of Guanylyl Cyclase. A. M~adulsch and R. Gerzer, Purification of Heme-Containing Soluble Guanylyl Cyclase. P. Humbert, F. Niroomand, G. Fischer, B. Mayer, D. Koesling, K.-D. Hinsch, G. Schultz, and E. B~adohme, Preparation of Soluble Guanylyl Cyclase from Bovine Lung by Immunoaffinity Chromatography. S.A. Waldman, D.C. Leitman, and F. Murad, Immunoaffinity Purification of Soluble Guanylyl Cyclase. S.A. Waldman, D.C. Leitman, and F. Murad, Copurification of Atrial Natriuretic Peptide Receptor and Particulate Guanylyl Cyclase. T. Inagami, R. Takayanagi, and R.M. Snajdar, Copurification of Atrial Natriuretic Factor Receptors and Guanylyl Cyclase from adrenal Cortex. S. Singh and D.L. Garbers, Molecular Cloning of Membrane Forms of Guanylyl Cyclase. M. Potier, C. Huot, C. Koch, P. Hamet, and J.Tremblay, Radiation-Inactivation Analysis of Multidomain Proteins: The Case of Particulate Guanylyl Cyclase. D.C. Leitman, S.A. Waldman, and F. Murad, Identification of Atrial Natriuretic Peptide Receptors in Cultured Cells. P. Hamet and J. Tremblay, Evaluating Atrial Natriuretic-Induced cGMP Production by Particulate Guanylyl Cyclase Stimulation in Vitro and in Vivo. J.K. Bentley, Phosphorylation and Dephosphorylation of Sea Urchin Sperm Cell Guanylyl Cyclase. J.E. Schultz and S. Klumpp, Calcium-Regulated Guanylyl Cyclases from Paramecium and Tetrahymena. Biochemists, endocrinologists, cell and molecular biologists, neuroscientists, analytical and clinical chemists, biomedical researchers, pharmacologists, and physiologists.